Whatever your brand sells, promotes or manufactures, your consumers will embark upon a journey. From initial consideration and realisation of a desire to the moment they click ‘buy’ or ‘download’, in order to make the most of your site traffic, it’s important to understand that journey in order to place signposts at all the right points on the path. Feel free to share this quick reference guide to the conversion funnel, or embed it, or even print it out for use in training and development. At Click Consult, we are always looking to communicate our years of experience in new and easy to understand ways. Like it? Let us know – and equally, if you feel we’ve missed something, tell us that, too! 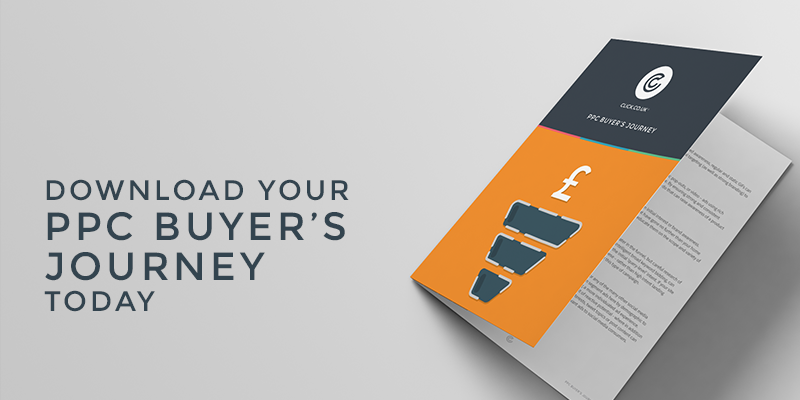 Whether you want to know what stage requires display advertising or remarketing, or how to match your ads to consumer intent, Click Consult has produced a short eBook to guide you through the buyer’s journey which should offer all you need to get to grips with the progress. Whether you’re new to PPC, or a seasoned professional, we have numerous resources and blogs available to help you progress. Think we’ve missed something, or want to speak to us to find out how we can get your brand what it deserves from paid search? Contact us today.